Having the right equipment can make or break a fishing trip. At Black Gold Lodge we won’t tolerate anything marginal, especially fishing gear. Our 16ft. Lund aluminum boats are comfortable and seaworthy with swivel seats and new 15 h.p. motors. These are excellent boats for slow motor mooching when targeting salmon. We outfit the boat with a 10.5ft. rod for each angler, single action mooching reel, 4 to 6 oz. ball weights, double hook leaders, and plenty of cut plug herring in salt brine: the time-honored solution for taking salmon. If you want to target halibut, we’ll swap out your mooching tackle with a sturdy bottom rig. Salmon gills and belly strips make an extremely effective bait. 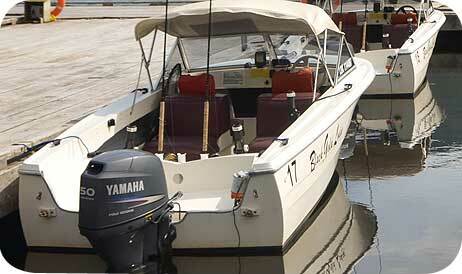 All boats are well maintained with radios and depth sounders as standard equipment. All your fishing needs are supplied: boat, fuel, tackle, bait, etc. We just want you to enjoy your trip and have great success. BOAT UPGRADES. A limited number of boat upgrades are available for guests who value added comfort and performance, including big motors that can get you to and from the fishing grounds in a hurry. See our selection of boat upgrades before booking your trip.